Planning a trip -- and totally not willing to check your suitcase since it costs at least $15 now? (This beauty chick was super unhappy to discover that even her fave airline, Continental, is now charging for bag number one.) So what's a gal not willing to part with her products to do? Why, come up with other alternatives, of course! And I am totally digging the new trend in beauty -- product packets! Each of the packets featured here will get you through a beauty jam in a jiffy. Whether you need fresh breath or fresh tresses, you'll score serious happiness on your travels! Read on to discover all the greatness that awaits your next trip! 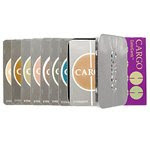 CARGO ColorCards ($24 at sephora.com): This box contains a whopping 28 various cards, each with a single-use eyeshadow slapped on the front that you can use to change up your look on a daily basis. Choose from Aegean, Mojave, Bermuda, Corsica, Green Bay and Yukon -- gorgeous jewel tones that really make your eyes pop! Supersmile Single Dose Powdered Mouthrinse ($16 at bathandbodyworks.com): Forgot your travel bottle of mouthwash -- or just don't feel like packing it? This packet is seriously so easy to use. Simply rip open the packet, sprinkle it with water, swirl it around your mouth and voila! Your teeth will be sparkling, your breath will be fresher than fresh, and your smile will be ear to ear! 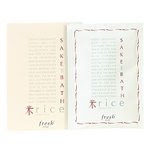 Fresh Sake Bath Packet ($12 at beauty.com): Sake bombs? So not as amazing as this little packet. Formulated with over 50 percent pure sake, this will turn any bathtime experience into the most amazing one you've ever had. So relax, duck your head under the water and ... well, don't drink up, but you get the idea. Ted Gibson Hairsheet Styling ($25 at tedgibsonsalon.com): Well, of course I'd have to put the Hairsheets in the lineup when Ted Gibson himself told me they're his favorite product! (Click here to check out his comments.) They refresh tired locks, make them smell fantastic and don't leave them feeling sticky or greasy. Tons of vitamins are packed into each and every sheet. And each box comes with 10 packets -- which, depending on how much you rub over your hair, can even be reused! Lisa Hoffman Skincare Spa Shower Packette ($25 at lisahoffmanskincare.com): Cleansing Gel. Body Scrub. Body Oil. Body Lotion. Hand & Foot Cream. Can all this exist in one packet ... or packette, as the case may be? Yes, when you're talking about this fab one from Lisa Hoffman! The miniature airtight ampoules each contain one product, meant to be used in tandem to keep you looking and feeling all day long. Out of all the Lisa Hoffman packettes, this is definitely my favorite! Ah, thanks for posting this! For some reason I'm a sucker for things in small packages. Not to mention that its a great way to try a new product. One thing I had to add: I love individual sunscreen packets. I'm always forgetting my sunscreen, and by the end of the summer I end up with all these last-minute sunblock purchases. Brilliant! ageless beauty -- What a fab idea! Definitely another one for the beauty arsenal.